For the last week, every time doogiepim starts my tasks and events pop-up with all due dates marked as overdue and I have to reset them all. When I open each task and event it shows the correct due date, in the future, but reminder alarm is always set to today's date, even tasks marked complete has the reminder alarm set for today and the original time off by only minutes. I have checked system date and time settings and they are correct. Restarting the system does not work. So I do not know if this is a bug or should I just try a repair or something else? Please show a sample of the data so I can guide further. I'd love to help but I can't suggest anything yet until I see how you've entered your data and what Task settings you've used. Many thanks for reporting and let's get this thing sorted out for you. Whatever it was doing just stopped, without any input from me, I have a feeling it might have been a windows 10 update which tends to screw up a lot of software. I have strange issues, too, with events I have set in my calendar. For example, I have a recurring event set every Thursday morning, with a reminder set for 15 minutes, and a 'default' resource (me!). Yet I seem to get quite random occurrences of the event being flagged as 'overdue' with a dialog on screen when I login to my computer. It's not just this one event - it seems to happen with other events, and they all seem quite random. Sometimes it's a day or so - other time it can be up to a couple of weeks after! I always just hit 'dismiss' or dismiss all' and the dialog disappears, but others will randomly still occur. Am I doing something wrong? Is the reminder logic working as it should? This isn't a show stopper - more just a niggling occurrence, but maybe someone could advise me if they have seen this behaviour, and how I can stop it? 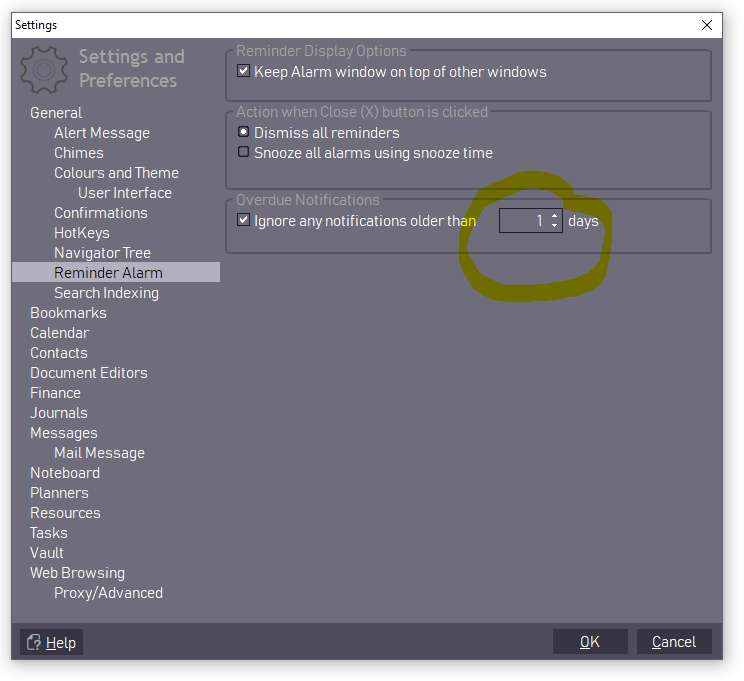 Try enabling this settings option, in the image below, and reduce the number to 1 day. That may help in reducing the old reminders that may not have been dismissed in the past.